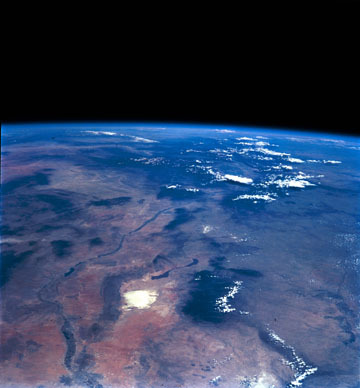 Space Shuttle photograph of the Rio Grande rift in New Mexico, and the Rocky Mountains of Colorado on the horizon, view north. The green band snaking down the center is the Rio Grande. White patch in foreground is gypsum sand in White Sands National Monument, with basalt flow just to north, and the Sacramento Mountains to the east. Albuquerque and Sandia Mountains lie in the center of photo. Taos valley is just south of the large cloud in the upper right. NASA # STS094-730-4. July 5, 1997. Spacecraft Altitude: 159 nautical miles (294 km). Camera: Hasselblad, 100mm focal length. Penguin on main page from a photograph by Bill McIntosh, digital photo manipulation by Becky Titus. For more images, visit the NASA Office of Earth Sciences archive of astronaut photos of the earth.